This article is about the genus. For the species, see Squatina squatina. "Angel Sharks" redirects here. For the French movie, see Marie from the Bay of Angels. Angelsharks, off the coastline of Wales. The angelsharks are a group of sharks in the genus Squatina in the family Squatinidae, which are unusual in having flattened bodies and broad pectoral fins that give them a strong resemblance to rays. This genus is the only one in its family and order Squatiniformes. They occur worldwide in temperate and tropical seas. Most species inhabit shallow temperate or tropical seas, but a few species inhabits deeper water, down to 1,300 m (4,300 ft). Angel sharks are sometimes called monkfish, although this name is also applied to members of the genus Lophius. While some species occur over a wide geographic range, the majority are restricted to a smaller area. Restriction in geographic range might be as a result of the behavior of Squatina species, which are ambush predators with a corresponding stationary bottom-dwelling habit. Thus, trans-ocean migration is extremely unlikely, even though large-scale coastal migratory patterns have been reported in species such as S. squatina. Angel sharks possess extensible jaws that can rapidly snap upwards to capture prey and have long, needle-like teeth. They bury themselves in sand or mud lying in wait for prey, which includes fish, crustaceans and various types of mollusks. They are ovoviviparous, producing litters of up to 13 pups. Pacific Angel Shark pups are born from March to June in deep water — generally 180 to 300 feet (55 and 90 metres) — possibly to protect the tiny pups from predators. Angel Sharks usually reside in depths of 1–200 m and can be seen on muddy or soft bottom substrata where they can easily blend in as they lie on the bottom. Areas with the greatest habitat suitability consist of ideal temperature, chlorophyll, salinity, and depth levels. 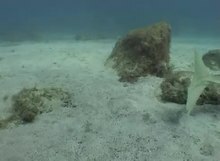 Since Members of the family Squatinidae have a unique camouflage method, it goes hand in hand with how they obtain their food, by lying still on the sea floor, making rapid lunges at passing prey,and using negative pressure to capture prey by sucking it into their mouths. Morphological identification in the field can be difficult due to discontinuity and similarity of species. In this specific circumstance, the sharks' place within the class Squatina comprises three species in the southern part of the western Atlantic. The three species observed were Squatina Guggenheim, S. occulta and the Brazilian guitarfish Pseudobatos horkelii. These three species are listed in the IUCN Red List as threatened, and they are now protected under Brazilian law, which makes angling and exchange illegal. To prevent landing and trade of these endangered specie along the Sao Paulo, DNA barcoding was used. DNA barcoding revealed fishing and trafficking of these protected species. Although this shark is a bottom-dweller and appears harmless, it can inflict painful lacerations if provoked, due to its powerful jaws and sharp teeth. It may bite if a diver approaches the head or grabs the tail. Angelsharks have a unique way of breathing compared to most other benthic fish. They do not pump out water from the oropharyngeal cavity like other fish. Instead they use gill flaps located under their body to pump out water during respiration. Doing so also allows them to be more discreet and prevent detection. 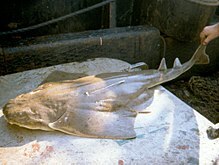 Prior to the late 1980s, the Pacific angel shark was considered a "munk fish". It was a byproduct of commercial gillnetting, with no commercial appeal and was used only for crab bait. In 1977, Michael Wagner, a fish processor in Santa Barbara, California, in cooperation with local commercial fisherman, developed the market for angel sharks. The annual take of angel shark in 1977 was an estimated 147 kg. By 1985, the annual take of angel shark on the central California coast had increased to more than 454 metric tons or an estimated 90,000 sharks. The population declined dramatically and is now regulated. Due to Angel Sharks living very close to the shore they often got captured, when there weren't the target for the fishermen. In 1991, the use of gillnets in nearshore state waters of California was forbidden, and fishing was restricted in a larger portion of the Pacific Angel Shark’s range. This helped the Angel Sharks not get caught more often. In April 2008, the UK government afforded the angel shark full protection under the Wildlife and Countryside Act. Once considered abundant in the Atlantic Ocean, the angel shark (Squatina squatina) was classified as "critically endangered" in 2010. ^ Bourdon, J. (2011): Genera from the Fossil Record: Squatina Duméril, 1806. The Life and Times of Long Dead Sharks. ^ a b Stevens, J. & Last, P.R. (1998). Paxton, J.R. & Eschmeyer, W.N. (eds.). Encyclopedia of Fishes. San Diego: Academic Press. pp. 64–65. ISBN 978-0-12-547665-2. ^ a b Stelbrink, Björn; von Rintelen, Thomas; Cliff, Geremy; Kriwet, Jürgen (February 2010). "Molecular systematics and global phylogeography of angel sharks (genus Squatina)". Molecular Phylogenetics and Evolution. 54 (2): 395–404. doi:10.1016/j.ympev.2009.07.029. PMID 19647086. ^ Froese, Rainer, and Daniel Pauly, eds. (2016). "Squatinidae" in FishBase. January 2016 version. ^ King, J., & Tribuzio, C. A. (2017). Northeast Pacific Shark Biology, Research, and	Conservation, Part B. ^ Martin, R. Aidan. "Sandy Plains: No Place To Hide". ^ Lyons, Kady; Lowe, Christopher G. (August 2015). "Organochlorine contaminants and maternal offloading in the lecithotrophic Pacific angel shark ( Squatina californica ) collected from southern California". Marine Pollution Bulletin. 97 (1–2): 518–522. doi:10.1016/j.marpolbul.2015.05.019. PMID 25986655. ^ Bunholi, Ingrid Vasconcellos; Ferrette, Bruno Lopes da Silva; De Biasi, Juliana Beltramin; Magalhães, Carolina de Oliveira; Rotundo, Matheus Marcos; Oliveira, Claudio; Foresti, Fausto; Mendonça, Fernando Fernandes (October 2018). "The fishing and illegal trade of the angelshark: DNA barcoding against misleading identifications". Fisheries Research. 206: 193–197. doi:10.1016/j.fishres.2018.05.018. ^ Bester, C. (2010): Florida Museum of Natural History. Pacific Angelshark. ^ Standora, Edward A.; Nelson, Donald R. (1977). "A Telemetric Study of the Behavior of Free-Swimming Pacific Angel Sharks, Squatina californica". Bulletin of the Southern California Academy of Sciences. 76 (3). ^ a b c d Richards, John B. (1987). "Developing a Localized Fishery: The Pacific Angel Shark". In Cook, Sid F. (ed.). Sharks: An Inquiry into Biology, Behavior, Fisheries, and Use. pp. 147–160. hdl:1957/23696. ^ King, Jackie; McFarlane, Gordon A.; Gertseva, Vladlena; Gasper, Jason; Matson, Sean; Tribuzio, Cindy A. (2017). "Shark Interactions with Directed and Incidental Fisheries in the Northeast Pacific Ocean: Historic and Current Encounters, and Challenges for Shark Conservation". Northeast Pacific Shark Biology, Research, and Conservation, Part B. Advances in Marine Biology. 78. pp. 9–44. doi:10.1016/bs.amb.2017.09.003. ISBN 978-0-12-812394-2. PMID 29056145. ^ Fowler, S. (2010). "Background Document for Angel shark Squatina squatina" (PDF). German Federal Agency for Nature Conservation. ^ Walsh, Jonathan H.; Ebert, David A.; Compagno, Leonard J. V. (7 February 2011). "Squatina caillieti sp. nov., a new species of angel shark (Chondrichthyes: Squatiniformes: Squatinidae) from the Philippine Islands". Zootaxa. 2759 (1): 49–59. doi:10.11646/zootaxa.2759.1.2. ^ Acero P., Arturo; Tavera, José J.; Anguila, Rafael; Hernández, Luis (July 2016). "A New Southern Caribbean Species of Angel Shark (Chondrichthyes, Squaliformes, Squatinidae), Including Phylogeny and Tempo of Diversification of American Species". Copeia. 104 (2): 577–585. doi:10.1643/CI-15-292.